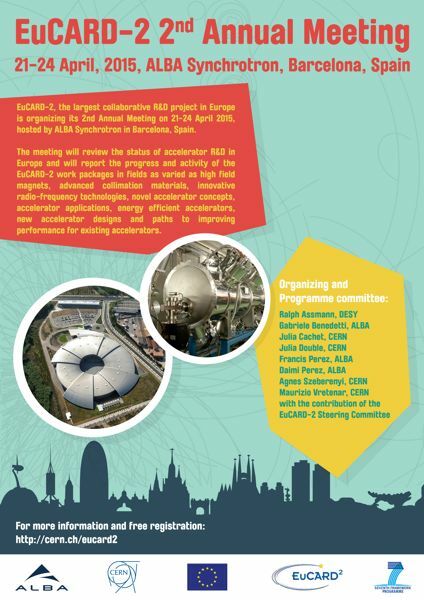 EuCARD-2 is organizing this second Annual Meeting on 21 - 24 April 2015, hosted by the ALBA Synchrotron on the Campus of the Autonomous University of Barcelona. The meeting will review the status of accelerator R&D in Europe and will report the progress and activity of the EuCARD-2 work packages in fields as varied as high field magnets, advanced collimation materials, innovative radio-frequency technologies, novel accelerator concepts, accelerator applications, energy efficient accelerators, new accelerator designs, and paths to improving performance for existing accelerators. Plenary sessions will take place on Tuesday 21st and Wednesday 22nd April, and the Governing Board will meet on April 21st. As usual, a series of parallel work package meetings will follow on 23rd and 24th April. The meeting is open to EuCARD-2 members, for whom the meeting fee is covered by the EuCARD-2 management. External and local participants willing to attend the meeting are invited to contact the meeting secretariat for information regarding conditions and fees.